Did you know that nowadays most of the “condensed milk” you see on the market aren’t actually made with real milk? And the “real” ones generally can be quite expensive as they were all imported. Well here’s a piece of good news for you: F&N recently reintroduced the Full Cream Sweetened Condensed Milk and is currently the only local company that offers Malaysians the creamy goodness of full-cream sweetened condensed milk at an affordable price. I remember when I was growing up, condensed milk played a big part of my life. There was always an opened can (poured into small container) in our fridge and it was used for many things. One of my favourite snacks was a Cream cracker drizzled with a hearty amount of condensed milk. Back then it was a fun challenge to finish the cream cracker without the condensed milk dripping from the holes. As soon as I moved to Australia, condensed milk disappeared from my life. 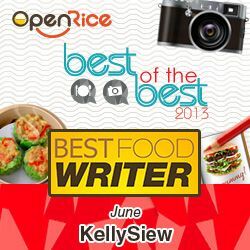 I guess it’s very much a Malaysian thing as you’ll see condensed milk used everywhere in local kopitiams and mamaks, and most household too. 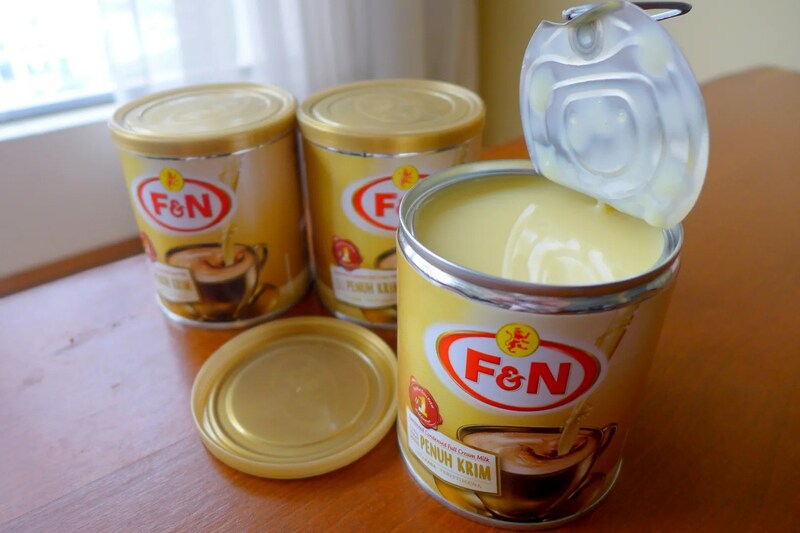 So what’s so special about F&N Full Cream Sweetened Condensed Milk? First of all, it contains the wholesome goodness of milk, which makes it richer, fuller and creamier. Secondly, it’s also nutritious, with high amount of calcium, and the added benefits of vitamin A, B1 and D3; and as you know, milk is a good source of protein too. Tasty and beneficial, what’s not to love? Of course, enjoy it in moderation as it does contain quite a bit of sugar. But occasional indulgence is essential, let me tell you that. 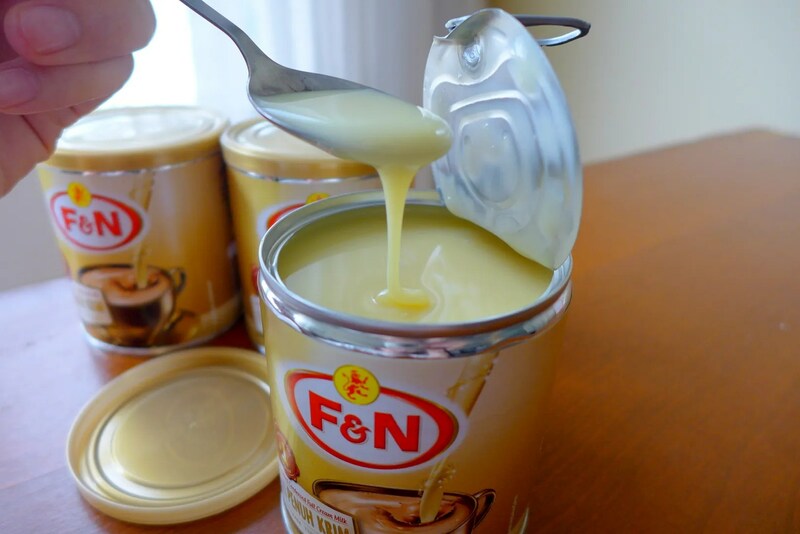 I was sent a batch of F&N Full Cream Sweetened Condensed Milk to review and while I normally wouldn’t be consuming so much sweet stuff, I was curious about the taste (I guess you can say that condensed milk is my weakness). Upon receiving the package, I immediately open one and tried a spoonful (don’t judge k?). It is indeed rich and creamy and tastes really sinful. The next few days I proceed to add this into my coffee. Such bliss. I also used it in a couple of recipes which I will show you in a minute. By the way, I really dig the new packaging which has a pull ring for easy opening (I remember the day when I used to dig 2 holes on the can and let the condensed milk slowly drip out into another container), and a plastic lid so I can store the can itself easily. So I finally attempted to make my own Dulce De Leche! Dulce De Leche is basically caramelised milk and is prepared by slowly heating condensed milk to change its flavour and colour. Traditionally, it takes hours to achieve this, often requiring boiling for up to 4 hours. But I had the perfect tool to save me some time, in a form of Philips Pressure Cooker! That’s right, with a pressure cooker, making Dulce De Leche takes only about an hour (that is if you don’t count the essential cooling down time, of course), and it’s definitely foolproof too! Let’s take a second to admire this heavenly creation of mine, shall we? To make perfect Dulce De Leche, first place the can of Condensed Milk side way in the Pressure Cooker Pot, and fill with water to cover at least an inch above the can. Then, set your timer to 40 minutes and start the cooker. Once the time is up, release pressure, remove the can cautiously. This is super important: let it cool COMPLETELY before you attempt to open the can. If you don’t, the content will explode, and you’ll end up with severe burns. But when it’s cool it’s absolutely safe to open. Then control yourself not to finish this by the spoonfuls (will probably get into diabetic coma if you do). So what did I make for with the Dulce De Leche? Banoffee Pie of course! This has been on my to-make list for years and I didn’t go through because I didn’t want to waste 4 hours of gas just cooking a can of condensed milk. The Pressure cooker is really a life-saver sometimes. 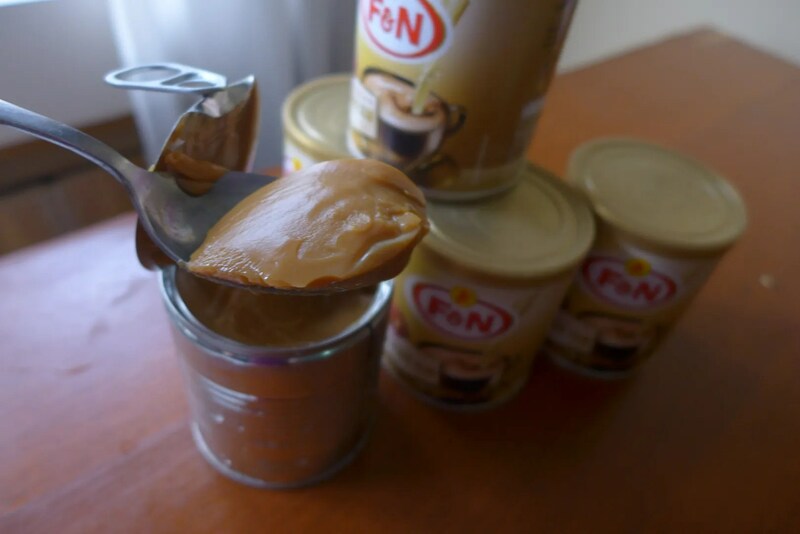 Oh, I digress, this post is about F&N Full Cream Sweetened Condensed Milk. Haha. Here’s the Banoffee Pie. Oh you, get in my mouth! To make pastry, mix flour and salt together then rub in the cubed butter until mixture resemble breadcrumbs. Add ice water (add 1/2 first, and pour in more as needed) to draw the moisture and mix until the dough just comes together. Form pastry into a disc, enclose in plastic wrap, then refrigerate for at least 30 minutes. Preheat oven to 180C. Roll out pastry on a lightly floured surface until 5mm thick and use to line 6 x 12cm tart pans. Trim edge carefuly, then line with baking paper and fill with dried beans or rice. Bake for 15 minutes, then remove beans and paper, and bake for a further 5 minutes or until golden. Set aside to cool. I guess it goes without saying you need to whip the cream until stiff peak, then set aside. Once the tarts are nice and cool, spoon over the dulce de leche and spread it flat. Slice bananas and coat them with a bit of lemon juice (this provides a little acidity to balance the taste and also keeps the banana fresh for longer), then lay them however you like on top of the dulce de leche. To serve, spoon generous amount of whipped cream on top. Make this today to impress your friends! I brought this to my gig for my musicians and made them very, very happy. F&N Full Cream Sweetened Condensed Milk is now available at selected outlets (Ben’s Independent Grocer, Jaya Grocer, Hero Market, AEON, Jason’s Foodhall, Mercato, Village Grocer, Isetan, Cold Storage and Presto Grocer) throughout Peninsular and East Malaysia for RM5.00 per 392g can. 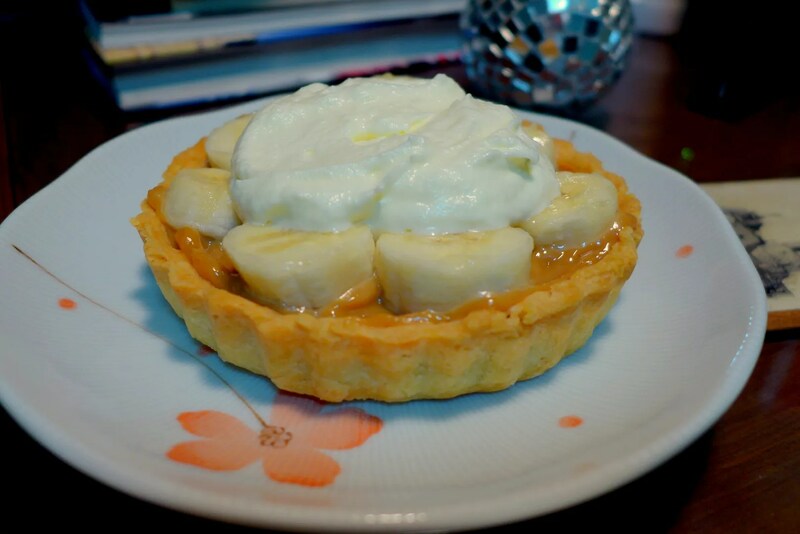 Your Banoffee pie looks so delicious! I recently discovered how to make dulce de leche and when I do I have to stop myself from eating the whole lot!! I know right! I treated myself to a teaspoon earlier….. Feel so naughty!